Radical political militancy is never intellectually unarmed, for it always assumes some understanding of what it contests and of how it can or should be overcome. It also carries with it some idea of what is to follow the detested social order. But it is precisely because of the weight of these assumptions that militancy is dangerous even for the militant, for all may go terribly wrong at all three of these levels. In other words, a non-reflective militancy is blind, and fatally so. Originally published by Autonomies. Written by Julius Gavroche. The essay we share below is not presented with the presumption that it holds all of the answers. However the intensity with which it is written, and at a time of widespread political struggle in france, makes it an important contribution to a debate that will never be closed; and rightfully so. Perhaps our greatest doubt touches paradoxically on the idea of militancy itself, for the reflection is haunted by the desire for power. If anarchist rebellion/revolution aspires to the destruction of power, then it is not clear how a radical conquest of power, even if not the power of social hierarchies, avoids the pitfalls of reasserting power. But we also share the essential idea that “multiplication of means of autonomy goes hand in hand with the multiplication of the possibilities of solidarity and action”, and that thus the former must be constructed, with determination and as often and in as many places as possible, if we are ever to move beyond the ends of capitalism. It is no longer necessary to describe by examples or to illustrate by argument what becomes obvious to everyone: we have arrived at a point of brutal change in the society in which we live, where it is no longer a matter of going out on strike intermittently, of writing intellectual declarations in “left-wing newspapers”, or of demonstrating openly and legally on the worn pavements of the great squares of France, if any of this has really moved us forward in the last decades. In fact, with the slow and inexorable collapse of the hegemonic Communist Party and its godchild, the CGT and all its trade union offspring, balloons and banners are now more of a quaint decorative accessory than banners for trade unionism and triumphant militancy. The debacle is complete and Macron is only an avatar among others of an exultant capitalism that succeeds in integrating the peoples, like the kings of old who held under their rule the populations exhausted by labours and frozen by the fears of the vast world. And we come back to this. But the meaning of my reflection is not to be found in lamentations and historical considerations about the hypotheses of the origin of the disaster. We lose far too much time contemplating the past and feeling helpless before the extent of the struggles that face us. Scattered, fragmented, we are as if petrified by the inexorably advancing tsunami and we try frantically and hastily to save some furniture here and there. In vain. The social movement around the new labor law, if it knew a certain coherence and a certain strength, it was not so much because of the intensity of the conflictual balance of power that the movement created over months in the streets. If the heterogeneous social movement was able to maintain itself for so long, it was because we saw the rebirth here and there of inter-struggle assemblies (be it a little incongruously in Nuit Debout or in the libertarian action committees, in inter-professional and inter-struggle assemblies, and notably, at the initiative of support workers in theatre and related cultural activities); but also, because of the existence of places of organization in support of the mobilisations (the House of the People squat in Rennes or the few labor exchanges which rediscovered their first vocations); or, because some benefited from logistical support from neighbouring battlegrounds (for Nantes, the proximity of the Notre-Dame-des-Landes ZAD provided logistical support to protests and demonstrations). But all of these bases are too weak, derisory, when compared to what they may have been at other times, when each city had its vast places for meetings and the organisation of contestation, when strike funds were not held together by three bits of string, and when solidarity was not just a word that inspires dreams, but a concrete reality inherited from a whole labour, peasant, or activist, communist and libertarian history. Today, we are generally poorly equipped, ignorant, or too full of theories but terribly ignorant of how to implement them in practice. The Popular Front, the Spain of 36, the Commune and even May 68 are nostalgic images that fade in ageing and tired memories and the disappointments of the last 20 years. Labour unions, NGOs, opposition parties are collecting palliative care, only too happy to be able to show that their monthly budget, that their membership’s dues, pay for anything other than food, and instead, glossy paper budget statements or the costly pay of their Parisian employees. When slogans serve but to fill the banners at the head of a demonstration, or to stack chairs behind the doors of universities, or to mobilise for tired strike days in the civil service and in a heavily de-unionised private sphere, it is difficult not to see the end before the beginning, even though the wind of revolt blows again in the streets of Paris, Nantes, Rennes, Lille, Lyon, Toulouse, Marseille and some other cities. A few months after the name of El Khomri had already been thrown into the dustbin of history, the list of the accused in protests against the labour law continues to grow in the courts, surpassing that of those tried in the 2006 protests against labour contract deregulation. The balance sheet is heavy, the benefit difficult to estimate, as the past, present and future are today confounded in a frantic flight forward. If we must retain something of the struggle against the CPE, it is because it has among other things formed the generation that planted the roots of the occupation of Notre-Dame-des-Landes. This is an occupation that has allowed the emergence of a place of convergence, of social experimentation and of political education and confrontation, that is so lacking in the rest of our urban and rural struggles; as well as logistical support, a source of radicality and rediscovery of the physical balance of power with the state and the great economy of the management of living spaces. A base behind the lines that the State wants to destroy or normalize today at any cost, aware of the hemorrhage of hot blood that flows to so many other places, where its imaginary has been contagious and inspiring. 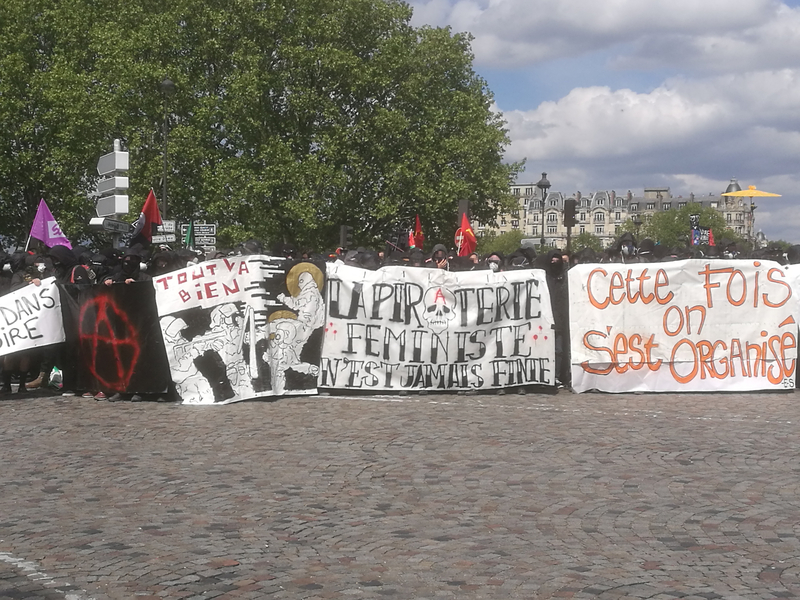 Many are those who, from the COP21 through to Nuit Debout or the Cortège de Tête [occupying militantly the front of a protest demonstration, often in the form of a “black block”], have joined Bure, struggles alongside migrants, have tried to open squats in the cities or extend self-managed spontaneous structures inspired by the anti-labour law movement, have been caught up in everything that can help keep the flame going that months of street fury have fueled and that the suddenness of the end of the movement has left hungry. The danger of these individuals or groups throwing themselves into a renewal of the ardent memories of the labor law struggle threatens them all, but also their elders, who are nourished by the dream of the great day and who let themselves be contaminated by all the popular fevers that germinate here and there. I believe that we must first get past this trade union imaginary of “social movement” and consider ourselves in a continuous and necessarily perpetuated struggle, even if its intensity increases or decreases. We are engaged basically in an asymmetric social “war” against capitalism and authoritarianism, and this requires that we make a “war effort”, to “arm ourselves” at the height of the conflictuality that this presupposes. And I say asymmetric, because some, fed by Hollywood heroism, are always ready to play the game of the epic charge against police adversity, even though the latter will never be but momentarily overwhelmed and they will come back better armed and more numerous the next time. The social war that must be waged is an invisible, low-intensity guerrilla war, a discreet reinforcement of the means of resistance in networks and a conflictuality reserved above all for the preservation, if it is necessary and brutal, of the means and places of struggle. And to this is added the necessary and regular sabotage of what makes up the power of the adversary that endeavours to reduce our spaces and possibilities of autonomy. It is also necessary for us to free ourselves from the unitary, monolithic vision underlying the idea of movement and reinforced by the redundant slogan of “everyone united [tous ensemble]”. We are a multiplicity that remains rich in its diversity, a diversity that needs only to be complementary and not unified, in its energies. What seduced the minds and hearts of those in the cortège de tête is this heteroclite, spontaneous and collective intelligence that has been enlivened with each new addition. Self-management in practice, with its medics, anti-repression groups, logistical support, canteens, etc., that fortify themselves, are formed and are inspired from one place to another, in the course of events and reflections. On these bases, the cruxes of this war are, as for all wars: financial and material means, tools of communication, points of withdrawal, care and organization. Except that here, it is about achieving autonomy for all these means, tools and places. Our very strong individual and collective dependence on social “aids” of subsistence, on subsidized legal and real estate structures, on public or private wage resources, have very much removed us from the autonomy that we demand at all costs, but that we realise very little in practice. And I do not see here a system D, a “social and solidarity” economy or associations, unions, parties or charities sustained by membership dues, that are worth it. The first reduces us to pirates whose misery depends on the sail which we hoist. The second, under the guise of eco-friendly social capitalism, has little to do with social struggles and simply self-finances and feeds its good conscience to soften the imminent end of a world. The last, finally, continue to mimic a time when x times more numerous members put 20% to 50% of their salary into a common war chest, against 1% to 5% today. Wherever we stand, the threat to our lives and the implementation of concrete means of action is far below what we demand from our struggles and the urgency that we feel to mobilize for the future. It is a giant step forward that we have to take collectively and individually, reducing our comforts and striving for the continuity of our efforts. But for that we must also rid ourselves of this political aversion to labour, that confuses wage labor with a free, individual effort in the collective construction of means of action. If we want to expand the number of those who struggle, we must, with diligence, concretely demonstrate the ideals we defend, that is, at least by realising the premises of our individual and collective autonomy. The perenniality of our struggles is constantly confronted with the precariousness of our livelihoods, and it is the density of the mesh of squats and system D [DIY] networks that compensates for this precariousness. But the first as much the the second risk being brutally brought to an end by legislation that tends to reduce all interstices to what is legal. And on that day, it will be difficult to turn things around, if we do not anticipate it. And this is true for all of our “freedoms” that are gradually redefined and restricted by the coercive contours of the law, in all spheres of life. Military service, compulsory work, house arrest, etc., are all things that seem unimaginable, but that could soon join the train of authoritarian measures that Macron, his predecessors and his successors, implement, and in ever more uninhibited ways. It risks also soon becoming very difficult to extricate anyone from their individualistic preoccupation with survival, or to convince anyone that the risk assumed by our actions is still worth the effort, while their benefits or goals becomes increasingly indiscernible. We congratulate ourselves today when we are 400,000 in the streets of the whole country, when 20 years ago, all that we could count on was a march in Paris. In truth, though, resignation is the only flag that is currently flying. For the rest, we are continually attached to “small wins”, just like others to their hummingbirds. At each fire, we rush with our derisory drops watching for the unexpected reinforcement of a mysterious horde of outraged birds that would rise to our call. In vain. Because if we have to get out of something, it is urgency itself: we cannot bail out each boat when its the whole ship that is taking on water; in the long run, it is better to provide ourselves with the means to save the larger ship. Whatever the resistance, it generally begins with a the history of a popular canteen or kitchen, because the first need of every human being is to feed her/himself, the next to take care of herself/himself and to take shelter. To give oneself the means of autonomy, but especially to give them to others, seems to me a necessary precondition for the multiplication of the number of those who struggle. And if we do not manage to subtract or recover enough food, then we must fatally produce it. The notion of production is closely linked to that of labour, and to that of property also. The three give rise to deep mistrust, so much has capitalism made them the first instruments for the subjugation of individuals and the first temptation of individualism. Here again I feel that we are wrong and that the three are not necessarily synonymous with venality or compromise with our libertarian aspirations. If the work is done outside of a salary and hierarchical framework, if production is separated from the notion of personal benefit and that along with property, if it is conceived on the basis of and towards the satisfaction of needs and a collective advantage, then we can inscribe them all in networks where they can truly benefit a very large number of individuals, groups, collectives, depending on the scope given to them. Accordingly a popular kitchen that gives itself the means to feed 100 or 1000 people will not offer the same logistic prospects for action. Similarly, an acquired place that can accommodate 300 people for one assembly will not be comparable in organizational potential to another of the same size, rented from an owner and subject to external pressures and constraints. A field planted and cultivated collectively on the outskirts of a city and which makes it possible to harvest several hundred kilos of vegetables is not comparable to the same result, consequence of numerous random acts of appropriation from supermarkets. The multiplication of means of autonomy goes hand in hand with the multiplication of the possibilities of solidarity and action. Action must therefore flow from logistical means and not rush ahead of them, otherwise it will always be ridiculous. And according to the expectation that we have for action, it is necessary that we give ourselves the time to gather the necessary means to realize it, even if it means to give up other actions, so at to be able to concentrate our efforts and not scatter them. If we want to confront the next months of mobilization, we have to anticipate the places that will allow us to organize ourselves and meet, those that will allow us to house and to treat ourselves, to restore us in sufficient numbers. We need then to plan for sufficient supplies of food, to evaluate the possible numbers to accommodate, and if necessary, to think of alternative care structures. As far as the organization is concerned, multiplicity must be thought of in frameworks that preserve it and protect it from individual or structural takeovers that tend to reduce it, with the appropriate tools. Thus, a network operation of assemblies that intersect but do not obey a hierarchy of scale: the assemblies of places should overlap and be complementary to assemblies of cities or inter-struggles, or inter-places. The tools of anti-repression, communication, logistical and financial organization must multiply, but not compete with each other, otherwise they must merge to fit to a new scale or a new goal (eg. an inter-professional strike fund that would result from the merger of several professional branches, for balancing inter-struggle solidarity, or a website like Paris-luttes.info which relays the publication of several blogs of struggle, to allow a better overall visibility of struggles and a greater ease of access to information of the different struggles, by their regrouping and overlapping). Inter-struggle assemblies often lose themselves in their quest for unity of political speech, to the detriment of the concrete mutualisation of means. Often, speaking out tends to express feeling or endeavours to have a political argument triumph, rather than restitute an action or share information on a project. An assembly made up of a great diversity of individuals and structures can not lead to consensus of action or ideas. The actions proposed by an individual or a structure should not be submitted to debate within the framework of the assembly, but must lead rather to a new meeting constituted by all the interested parties. Similarly, if there is to be debate about the collective consequences of a particular action of a particular individual or group, then it is best to move that debate to a time after the review of events or factual information or to ask at a future time, something that will allow all those who are absent and likely to be interested in the debate to be able to join it. Another pitfall of any inter-struggle assembly is to want to form arbitrarily and in advance thematic work commissions, rather than starting from concrete proposals on projects, actions or specific needs, briefly stated at the assembly and to implement them in small groups afterwards. It is thus not necessary for the whole assembly to approve the action or the project, only that the latter does not fundamentally conflict with another, in which case the two groups making the proposal will meet with all those interested to find a consensus to present in an assembly, without the latter being dragged into an interminable adversarial debate. The multiplication of inter-struggle, inter-collective assemblies is in itself a network, and the passage of individuals from one assembly to another, at the local or national, or even international level, gives body to this network by the natural navigation of ideas and information. It is the diversity that makes up the richness of the assemblies, as well as the balance between these: overly specialized assemblies and restricted to a particular audience, whether strictly union, professional, student, corporatist, or of a too determined political colour, do not often sustain themselves enough and struggle to make themselves audible beyond their circle. The only formalisation that does not enclose the network in an artificial unit is that of shared tools and not subject to moderation: agenda, web page or a journal compiling publications, locations and material means of organization and storage facilities, etc. As far as the possible places for these assemblies is concerned, they exist and are often privatized and require more power to recover and inaugurate their more open use. Whether it is the labor exchanges, amphitheatres, squares, parks, theaters or production sites, if they allow the public who usually use them to organize momentarily in a determined struggle, they remain difficult to access for an outside public. With an increased segmentation and specialization of public uses of places under the pretext of security, it has become almost impossible, even for the usual users, to occupy them temporarily in protest. There is a real struggle to be made for the de-privatization of spaces, even by physical force, if necessary. In addition, the occupation of unused spaces by inter-struggles remains extremely marginal, while many halls, warehouses, empty office towers exist everywhere. On the other hand, this presupposes that everyone does not return home and that a durable and consequent occupation in large numbers maintains the balance of power in the building. In addition, pooling the financial resources between struggles so as to rent several small premises that would allow permanent care and legal assistance, printing, workstations, infokiosks and libraries, workshops, storage areas, mailboxes, self-managed canteens, could already contribute to densify the concrete logistic means of resistance and multiply the points of organization, withdrawal and rest. A sort of mesh of self-managed social centers on small scales. Finally, with regard to the resources with regards to which we are not autonomous, to draw up a list and to make contacts to know or multiply the available resources would make it possible to anticipate a lot of needs to which we may no longer be able to answer for in the times that will follow. Even though the D system at the moment often works surprisingly well, this is not always the case, and regularly, essential needs fail us at crucial moments, and we are constantly kept in uncertainty about our real and concrete organisational abilities, with all of the negative consequences that this may have for the security of individuals in a repressive context, or for the relevance of actions that are often too anecdotal and not very visible. If we come back now to the strategic question, as evoked by the text “Strategic proposals for the continuation of the anti-Macronism“, it seems to me important to place ourselves outside of a personification of the struggle, and I am speaking here of the figure of the adversary. Whether Macron, Valls before him or Sarkozy even earlier, our struggles crystallize on the most salient aspects of some personalities who are in fact part of a continuity of neo-liberal politics and global security. Even if all of these heads were planted at the end of a pike, the capitalist Bastille would still be far from falling. To think ourselves from the perspective of a long term social war, of sustained intensity, which exceeds five-year mandates, can only make us relativize the feeling of the need to break up the pavement with each new scandalous project of Mr. Macron and his suit and tie peers. As said above, the determination of resistance should focus mainly on preserving and obtaining new means of struggle. Whether it’s self-managed social centers, squated woods in Roybon or Bure, occupied city squares or lands and places of life, of struggle and organization in the manner of the ZAD of Notre-Dame-des-Landes and everywhere else, this is where our priority should move towards a fierce and uncompromising opposition, rather than aspiring to conquer a metre of pavement in police controlled streets. And if we want to resist in the long term, we must be careful not to give in to a repression that will soon paralyze us, through judicial controls, probations, subpoenas and house arrests; and for the most die-hard among us, jail. If anti-prison struggles are a shadow of what they were when thousands of political activists were behind bars in the 1970s and 1980s, we will still struggle with more vigor and leeway outside walls. To preserve ourselves from being irremediably damaged, to fight better and to last, seems to me a fundamental dimension to be taken into account if we do not want to contemplate with horror our ashes, when the iron hand will take off its democratic velvet glove and will hit really hard with the blank-check of a whole society rendered mute, resigned and devitalized. When I evoked care, above, I saw among other things the need to build anti-repressive groups that do not leave people abandoned, but who also know how to heal wounds, to reassemble the fragments of our lives when repression scatters them. Although we generally know how to organize support in the courts, we are often sorely absent in the moments that follow, alongside those who are serving their sentences, too little listened to and understood by those who surround them. Too often we tend to display our scars as our feats of arms and too little to confess and express the underlying wounds that can deeply undermine us in the long run if we face them alone, locked in our interior silences. Strategy is not to be understood in the martial sense of the term, but taking into account the feeling, the care, the place of the individuality of each. I do not want to place myself here in a quest for hawkish efficiency, but in an anarchist struggle in which struggle and construction of more just, anti-authoritarian and attentive political spaces of life are simultaneous and inseparable, right down to the very heart of the chaos of clashes. On this last aspect of confrontations: in the exaltation of the shouts, the shots and clouds of tear gas, we too often forget that the cop is only a buffer between what oppresses us and ourselves. S/he is deliberately placed between us and what we are fighting, like a catharsis for all our rage that s/he absorbs and then returns to us with the blows of a truncheon. S/he then becomes to our eyes this personified adversary, whose furious eyes signify their desire to punish us and whose tightened lips ooze contempt for who we are. But s/he her/himself is only a repressive pawn triggered by our determination to crush him to reach what lies behind her/him. Shocked by the physical violence s/he opposes to us, we often lose sight of what we were fighting for in the first place, to substitute for it a fight against police violence or the injustice of justice that takes over for the cop. Any manual of military strategy repeats it often enough: do not carry the fight on the ground of the opponent, but bring it onto yours. Faced with traditional armies, and the mobile gendarmerie of the CRS are a “less lethal” version of the same, let us be the guerrilla who sneaks up where we are not expected, who strikes and knows how to retire without lingering, which is only to her/his disadvantage and which exposes her/him excessively. And if we must throw up a fierce resistance, it is only to be on our ground, on the occupied lands or at the threshold of our places of life and struggle. And, to close this reflection, even if, at the end of a relentless resistance, we should lose our places of life and struggle, let us remember that we carry them with us, in us. Let’s always keep in mind Hakim Bey’s Temporary Autonomous Zone: it is in the constant displacement and re-association of our knowledge, our practices and ways of thinking, of life and action, that we guard ourselves against political stagnation. If movement we must be, it is that constant movement of ourselves as individuals within collective spaces, thought independently of physical boundaries, as networks of life and struggle, and this at all levels, physical and metaphysical. And let’s stop thinking about “deconstruction”, it’s the sum of our conditioning and the social constraints that deconstruct us. We are in perpetual discovery and awareness of our freedoms and, consequently, of the contours of what confines them. And what we deconstruct is above all our inhibition to dare to push the boundaries between us and our ideal vision of the world in which we aspire to live. If the ZAD of Notre-Dame-des-Landes were to be evicted and evacuated, the losses in terms of means of struggle would be considerable, but the constellation of individuals who constructed collectively around these means and the imaginaries they aroused, would disseminate them and then re-assemble them in countless other homes of life and struggle, that are a part of as many other networks of individuals and collectives. But to have something to reassemble, one must first give oneself the individual and collective means of assembling, of assembly. Let’s assemble then! Previous post: “Drop the Charges!”: Friday, May 11th Join Chelsea Manning and Former Defendants in DC!